Dating the Lorane Orchards packing house construction: Harvey Currin (married to W.W. Jackson’s eldest daughter) hired my father to build the packing house on the upper side of the territorial road. As a young man of perhaps 5 or so, I “helped” put the tar paper roof on it. So, it was in the early 1920’s and perhaps five years after the Currins had moved from south of Drain (from a large apple orchard) to the Lorane Orchard. So, this construction must have been done in the first half of the 1920’s. My feeling is that it was after all Doty’s had moved away for the Lorane Valley. Is Stony Point essentially at the north end of the Siuslaw Valley as determined by Farman and Hawley Creeks? That is, north of the old William Hawley ranch and a mile or so north of the old Scott Jackson place? If so, then the north side of Stony Point slopes steeply down to the headwaters or a branch of Coyote Creek? Up this latter was the first Scott Jackson ranch, perhaps a homestead. It appears a road now runs through it to Creswell. I hauled gravel from Eugene and graveled that road up as far as the site of a sawmill on the Jackson place…and worked in that sawmill…but that is another story for sure. Over the ridge, to the south and, thus, sloping into Lorane Valley was a large farm owned by a Charles Emery. I worked there, too. I’m confused about “Stony Point” for getting up out of the Long Tom (Coyote Creek) drainage in going to Eugene, some miles further north was a long climb up around a “Stony Point”. This was, upon leaving the Lorane Valley, on the right fork of the road, the left fork of which led to Crow and so on. From this Stony Point, one looked down from the cliff side road onto a fair-sized valley, probably Fox Hollow. From here on into Eugene, roads seem to have changed greatly: they don’t match with my next northern quadrangle or, for that matter, my memory, either. George Buddington was a real friend to us kids. In addition to reciting or reading us poetry, he made very long shavings in his carpentry shop out back and adorned our ears with them as “long curly hair”. Many, many of the names of people in your delightful book are well known to me, but who they were or what they were, I no longer know. Through high school, we lived on a ranch out Eugene’s West 11th Street; father, H.M. Doty, became deathly ill, so I went into the Civilian Conservation Corps for a year during which he died. After that year, I went to the University of Oregon. The ranch was sold. Mother moved to town. (Regarding frontispieces (photos) across from Introductory page in Sawdust & Cider..)…Who now lives in the big white house on the right in the middle photo?…or at that place? It also shows in the top photo. I think I remember remnants of the grandstand showing in the bottom photo. This would have been in the 1920’s, some years later after the Siuslaw Road was put in. This lowest photo of the Frontispiece must have been taken before the Siuslaw Road was begun. In doing so, they apparently got rock from a little point of high land that protruded toward the camera from a cut made for the road. I remember climbing the remaining rocks, and looking up to see what Phyllis Addison and, perhaps Virginia, were doing, I fell off backwards, lit on my head, and was stunned, out cold, for a while. Do you know when the Siuslaw Road was begun? It was years before the water grade road beginning from opposite the Territorial Road ran in a broad curve generally bordering the creek (or Siuslaw River) to the Cottage Grove Road, across it and a mile northward to where it rejoined Territorial Road. Do you have any record of who lived in the house on the southwest corner of the junction of the Siuslaw Road and the Territorial Road? I’m interested in the period of ca 1907 to 1922. Any information on where H.M. Doty lived during 1908 through ca 1921 (when he and family moved to Eugene) would be appreciated. Or, for that matter, what he or my mother did those years, etc. My last visit there, on a drive through in ca 1987, revealed two blackberry patches just on the Cottage Grove side of the little bridge at the bottom of Lorane hill on the Cottage Grove Road. They were favorite haunts of we kids who used to pick blackberries in them 60 to 70 years ago. 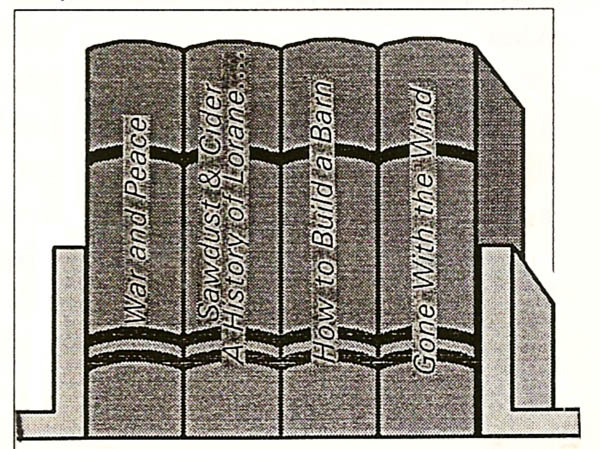 Thanks to Viki Meyer and a sizeable group of supporters, Lorane once again has its own community library. When Viki moved to Lorane in 1990, she had a desire to make a contribution to her new home. The method of doing so was presented to her when she decided to obtain a library card from the Eugene City Library. 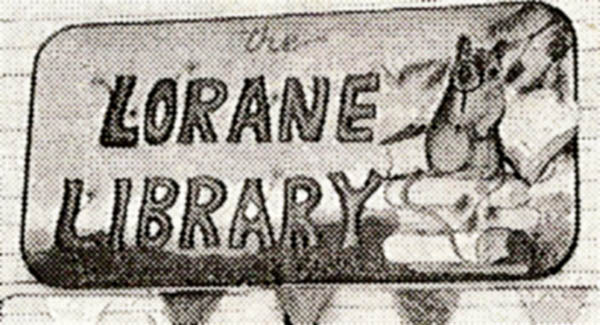 When she discovered that it would cost her $60 annually, she became determined to see if she could round up support for an on-site and affordable library for the people of Lorane. In researching the idea, Viki discovered that there were small collections of books in the Grange, Rebekah’s, and at the Lorane Famly Store that were seldom being used. She spread the word around the community about her interest, and found that many others were willing to support her idea to establish an actual library. 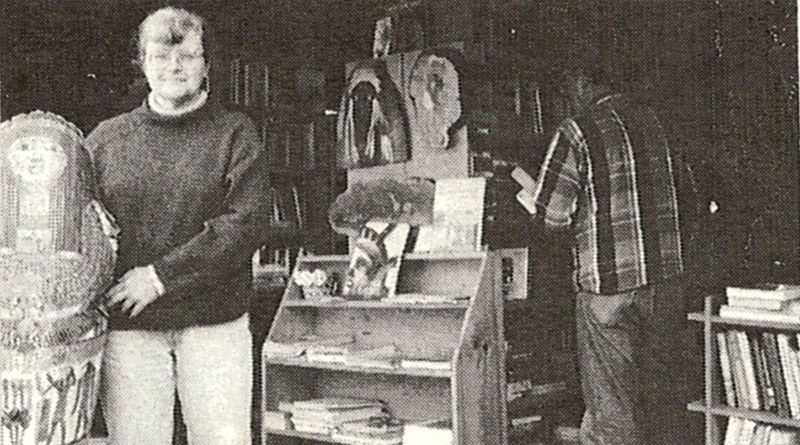 When he heard of it, Jim Kelly, who, at the time, owned the Lorane General Store, offered the use of the garage adjacent to his store as a site for the library. Donna and Bernie Moulton built the shelves, and those attending a community party painted the building. Once the physical preparations were finished, a call for books was made via word-of-mouth, newspaper, and television coverage. Books began coming in from all parts of the country. Well over 6,000 books have been collected so far, with over 2,000 in storage at Mel Keep’s until a larger place can be found for them. Bob and Fran Balmer, the present owners of the Lorane General Store have continued to allow them use of the building. The Friends of the Library who have contributed their time and energies on a regular basis include Alix Mosieur, Barbara Dare, Peter Crawford, and Curt Mitchell. Those who have agreed to be on call are Barbara Robertson, Connie Clark, Sandy Maxwell, Norman Hammar, Richard Miller, and Pete Gass. Approximately 200 families have registered, so far. Something that I have discovered since beginning The Lorane Historian, is that people are reluctant to tell me anything that might seem like “bragging.” One of the goals of this newsletter is to stress the positive in the community. I want to provide a forum for expressing the pride we have in ourselves and our families. If the historians, 100 years from now, want to “dig up the dirt” that is tucked in the corners of our lives, then that is their right. But in this day and age of so much negativism, I want to point out that there is something special about each of us, and we need to acknowledge it, not only to ourselves, but to each other as well. If you’re proud of your family, an accomplishment, a talent, anything in which you genuinely take pride, whether it be that your children have done something special, or you can grow white cauliflower, or your chocolate chip cookies won a prize at the county fair, or you have withstood hardship and triumphed, etc.– then, I want to write about it. Sure, our community has its share of the problems of the world, but I sincerely believe that even the most negative among us has positive qualities, as well, and I don’t want anyone to feel that they should withhold something because it might be considered “bragging.” Let’s express our honest pride — I don’t mean the false boastful kind that comes from personal insecurities, but the kind that can only build self-esteem and respect. There should be no shame in that. Mike and Linda (Bartgis) Jenks were both born in California…he in Long Beach and she in Los Angeles. They were married in 1962 in Downey, California. Mike had just been discharged from the U.S. Navy when he was offered training and a job with IBM. They lived in California for the first seven years of their marriage while being transferred for several months at a time to a variety of locations during Mike’s training period. He attended IBM schooling in San Jose, California, Rochester, Minnesota, and Poughkeepsie and Kingston, New York while they lived in Saugerties and Wappingers Falls, New York, respectively. During that time, two children were born to them. Colleen, age 30, was born in Downey. She is now in her 9th year of teaching high school English after graduating from Oregon State University. She is currently at Wahtonka High School in The Dalles. Mark, age 27, was born in Kingston, New York. He is presently a Captain in the U.S. Air Force stationed at Wright-Patterson Air Force Base in Ohio. He also graduated from Oregon State University where he had an ROTC scholarship. They eventually moved from California to Longmont, Colorado where Mike was transferred. They lived there for a year. According to Linda, “we were in Colorado when IBM was ready to send us back to the Los Angeles area. We had always wanted to live in a small rural community.” Mike and Mark travelled to Oregon to check out a position that was open with IBM in Salem. What they saw, they liked. When Mike applied for a transfer to Oregon, he was awarded a position in Eugene where he worked until his retirement in 1991. After they settled in Lorane, another child arrived. Ewing was born in the Cottage Grove Hospital almost 22 years ago. He is presently attending his 4th year of college classes at Oregon State University. (The Jenks raised a family of Beavers!) All three of their children graduated from Crow High School where Colleen was valedictorian and Mark the salutatorian of their classes. Mike is now retired from IBM and is a full-time farmer. (Neither he or Linda believe that “retired” is an appropriate word to describe him.) He had a variety of jobs before his stint in the Navy including newspaper boy and working in the oil fields. He’s presently a volunteer fireman and enjoys such hobbies as metal working, computers (naturally), photography, electronics, woodworking, and farming. Linda has been a homemaker since Colleen was born. Before that, she was a registered nurse. Linda loves teaching “Bible Club” Release-Time to Grades K-3, and has been teaching it for over 15 years. She says, “It isn’t long compared to the many years that Lorena Mitchell, who teaches the upper grades, has been teaching!” Another thing that Linda loves is doing all kinds of handwork. Her specialty is tatting and she has adorned some beautiful pieces with it. Linda also headed the Lorane Centennial quilt project, and it was mainly through her efforts and supervision that the community quilt became a reality. She also loves to garden and has a large vegetable and flower garden to tend. Both Mike and Linda are long-time members of the Lorane Grange. In the past, they have been actively involved in Lorane P.T.C., Lorane 4-H, Crow High School Booster Club, and the Lorane Centennial Committee, as well. Linda said, “As you can see by where we have lived, we have traveled across the U.S.A. a few times! The most fun that we have had was on vacation one summer in a houseboat with my parents on the Sacramento River. Michael was always doing things to keep it lively–like throwing mops overboard and almost getting us run down by a freighter.” Their last family vacation consisted of camping out in tents for 3 weeks while visiting friends on a dairy farm in Wisconsin. The Jenks are the type of family that represent the backbone of the Lorane community. Whenever there is an activity that requires community participation, they are always there. Whenever there is a community need, they are willing to contribute. They are always busy, but never too busy to give of themselves. It’s that willingness on the part of families like the Jenks that make Lorane the special place that it is. Editor’s note: The following excerpts are from a letter from Frances R. Anderson that was written to Nancy, Marna, and I in 1987, following the publication of Sawdust & Cider. The portions in italics are my responses to her concerns. I’ve recently finished reading the “labor of love” you, Marna Hing, and Nancy O’Hearn have so ably provided the rest of us. All of you are to be congratulated for your fine work which surely will be considered a valuable addition to anyone’s collection of local history. And, again, thank you for undertaking the task. (1) In the discussion of the Addison family (page 28), you speak of the marriage of Blaine C. Addison and Maud Jackson and throughout the remainder of the book Aunt Maud is referred to as “Maud G. (Mrs. Blaine Addison)” (page 33) or as Maud Jackson Addison–all of which may leave your more genealogically-minded readers with a false impression. Following a divorce from Blaine, Aunt Maud married John (Jack) Crawford in 1930, moved to California, and died there in the 1940’s. (A member of Maud and Blaine’s immediate family provided the information which was used. She read the copy which appeared in the book before it went to the publisher and apparently did not feel that it was necessary to discuss the divorce. (You will note that I did mention in the book that Blaine lived by himself for the last several years that he was in Lorane). (2) On Page 33, you refer to the four Jackson (W.W. and Della) children, including Helen who is further identified as Mrs. Herbert M. Doty. Aunt Helen married Mr. Doty around 1910 and later they adopted a son, Max. In the Doty family biographical account (page 30) there is no reference to Aunt Helen or Max, and I believe there should be. Just before the book was ready to go to press, I reviewed it to see if I had left any big gaps. One which I found was the absence of much information on the Doty family except for brief references to their lumber mill in the Lane County Directory; the house fire which destroyed not only their home, but the Grange records, as well; and records that they owned part of the Lucas Donation Land Claim according to Bob and Marna Hing’s property abstract. I felt that there should be more than that on the family as they appeared to have been a fairly prominent family in the area for some time. We were never contacted by any Doty family members, nor did we know of anyone to contact for an actual history of the family. For two years, we distributed questionnaires to anyone who would take them, to be filled out and returned to us so that we would be able to have factual information on each of the families. Because of the vast number of families who lived in the Lorane area over a 150-year period, there was no way that we could try to trace descendants of each one, and so we were relying on them to contact us, or by following leads given to us by others. No one ever emerged as a Doty family informant, so I had to go with what we had. (3) In speaking of the King family (page 52), you write of two teachers, Kay West and Mae Masterson, who in 1936 are reported to have lived with the Currin Family. These women may well have lived on Lorane Orchard Road, but the likelihood of their having lived with the Currins is remote. Ruth Currin Spaniol has no knowledge of her parents ever taking in boarders and tells me that H.W. and Laura Jackson Currin were no longer living in the area in 1936, having left in 1934 or 1935 at the latest. (4) Your reference to the introduction of Scotch Broom to the Lorane area by the Currin family (page 151) seems unnecessarily argumentative. We do not know your source for this information (you’ve chosen to use that uncertain phrase “It is believed…”), but we do know you did not talk to the only people (H.W. and Laura Jackson Currin) who might have been able to confirm or deny your suggestion. Both have been dead for over 20 years. Surely you did not intend to end an otherwise credible chapter with a 60-year old rumor. Your book, your readers, and the Currin family deserve better. In any case, as most of us know, Scotch Broom has long been common throughout Western Oregon and only blind chance can account for it’s possible absence in the Lorane area prior to the 1920’s. It was really only a matter of time before the shrub made it’s appearance in your community and no human assistance would have been necessary. If I had known that this would have caused embarrassment to the family, I wouldn’t have included it. The formula I used when I wasn’t sure if I would use an item or not was…”would I want it to be written about my family”. After spending many years in researching my own family history, I have always been excited about finding a bit of information about my family which made it stand out a little from all of the others whose members seemingly were always farmers who owned so many acres of land in Illinois or Kentucky, had large families and went to the Methodist Church. In this case, bringing in the Scotch Broom, I felt, was a very reasonable thing to do if one didn’t know what a culprit it would eventually become. It’s a beautiful shrub when it’s in bloom. If your family was, indeed, the one that brought it to the Lorane Valley for the first time, there should be no shame attached to it. They didn’t try to do anything other than beautify their yard. To me, it was a humorous account. There was no shame or illegality involved…We were told about it by someone who lived all of his life in the area and is past retirement age now. His father reportedly told him that the Currin family introduced it to the area. We have heard the same from others, so I felt safe in saying “it is believed…”. We should have checked on this with a member of your family to see if there was some sensitivity pertaining to it. I am sorry that we did not, and if there is a Part II to Sawdust & Cider, I’ll try to rectify it. Aside from the aforementioned points, the over-all quality of Sawdust and Cider is excellent, and I wish you equal success with future publications. Thank you, Mrs. Anderson ,for caring enough to write. Your comments have been taken in the light that they were intended. Are you toying with the idea of selling a piece of property that you no longer want to pay taxes on? Or, is your home no longer big enough to contain your growing family? Maybe the house is now much too large for a family whose young ones have declared their independence and have left to build their own lives? On the other hand, maybe you want to finally find that very special home of your own so that you can begin paying taxes instead of rent? If so, Lorane is fortunate to have two qualified and dedicated residential realtors among its residents. 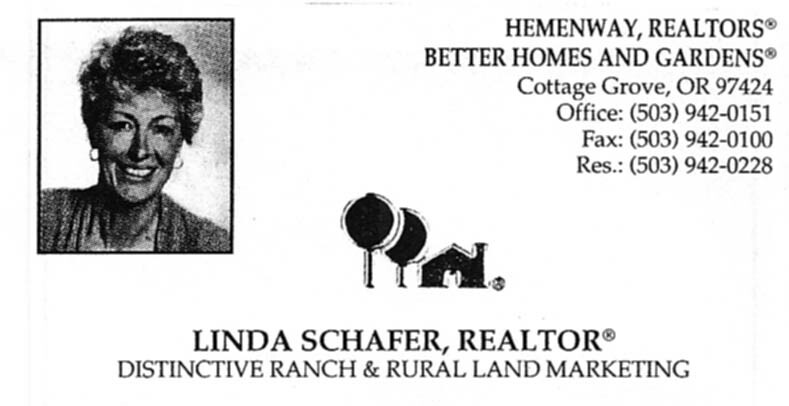 Linda Schafer, a relatively new member to the Lorane community, would like to help you in your real estate goals. Linda, who bought Jim and Pauline Sudut’s mobile home and 15-acres at the top of Stony Point in July of 1992, is a licensed realtor who specializes in rural properties and wishes to work for her neighbors in the Lorane area. Linda lived in Cottage Grove all of her life before moving to Lorane, and it has always been a special dream of hers to move to the Lorane area where she could ride and raise her horses. She has always lived on a ranch and is a member of the Quarter Horse Association, the Paint Horse Association, the Shorthorn Breeders Association, and now, the Lorane Grange. Besides her love for horses, Linda’s other interests include sports, snow skiing, and plays. She also likes to knit, sew, and work in her garden. 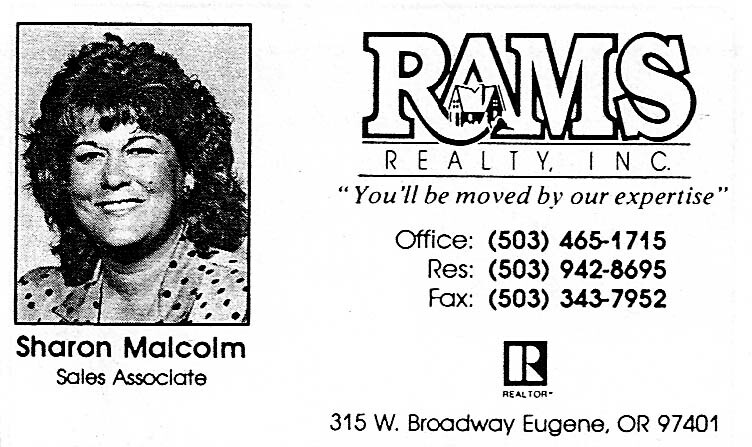 Before becoming a realtor, Linda worked in the medical profession. She has two adult sons, Jeff Elliott, age 26, who lives in Seattle, and Chris, age 25, who is married and lives in Eugene. Both graduated from Cottage Grove High School and the University of Oregon. Being a “country girl” at he art and having lived in the country most of her life, it only seemed natural to Sharon Malcolm that when she entered the real estate profession, she specialize in what she knew and loved. Sharon, her husband, Bruce, and their children, James Everett and Ashley Louise, live at 79555 Fire Road, where Bruce’s family has lived for over 43 years (see “Schuger family in Sawdust & Cider). Their neighbors on Fire Road include Jim and Judie Brantley, Corky White, Ron and Marla Norton, Clint and Sandy Rhodes, and Mike and Nancy Dresser. Sharon has been involved in various community activities, most centering around her family’s interests, including Lorane P.T.A. and the Crow Booster Club. The Malcolms enjoy camping, swimming, and traveling. They love Lorane and its feeling of community. When asked what she thought would make it a better place to live, Sharon said, “straighten out a couple of curves”, and her advice to the teenagers in the area includes “drive carefully, enjoy life, and get a good education.” That’s good advice for all of us.